stalls – you can be assured that market day in Vietnam is truly an unforgettable experience. journey for the 5-5:30 hours transfer. From 6:30 – 7:00 AM, you will commence from your hotel with Topas Mountain Express for a 5 hours transfer to the mountain town of Sapa. You then continue the ride to the remote hilltop located Topas Ecolodge. After checking in your bungalow, you will enjoy the beautiful and peaceful view of the surrounding mountains and valleys from your private balcony. The Red Dao village of Nam Cang is 20km from Topas Ecolodge. At 8:45 AM, you have a drive to the village, enjoying the picturesque views of peaky mountains, endless rice terraces, waterfalls and Hill tribes’ villages on the way. Nam Cang village locates at the far end of the road. The Red Dao women wear some of the most colorful and diverse costumes of all Vietnam’s ethnic groups. Herbal bath, local medicine and embroidery are some of the things that the Red Dao are very skilled at. Accompanied by your guide, you will explore around the village and learn how the local villagers make writing paper, jewelry and embroidery. You then have your lunch at the Nam Cang Riverside Lodge, enjoying the peaceful life on the banks of river. In the afternoon you can choose to relax at lodge, make more visits to the village, take a swim in the river or join a trek to explore the beautiful surrounding nature. The 3 hour moderate trek starts with an ascent to a small Blue H’mong village, but from here it is mostly straight and downhill with a beautiful view to the high mountains, waterfalls and the deep valley. 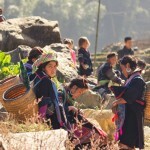 In the mid afternoon you will have a transfer back to Topas Ecolodge/ Sapa town. 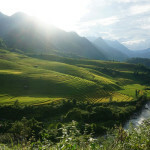 the journey to Lao Cai, where you continue the drive with Topas Mountain Express back to Hanoi. Number of persons 1 2 4 6 8 Single Sup. If you would like to stay in our Executive bungalows, please request this when booking. Meal prices at TEL for children below 4 years old are free of charge. Meal prices at TEL for children from 4-11 (including) years old are half price of above prices.